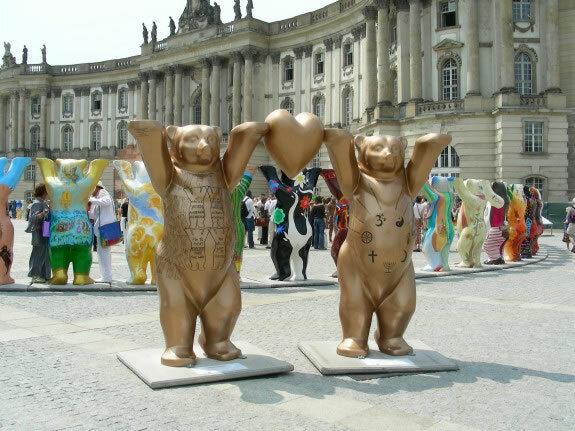 ...it makes us understand one another better, trust each other more and live together more peacefully." 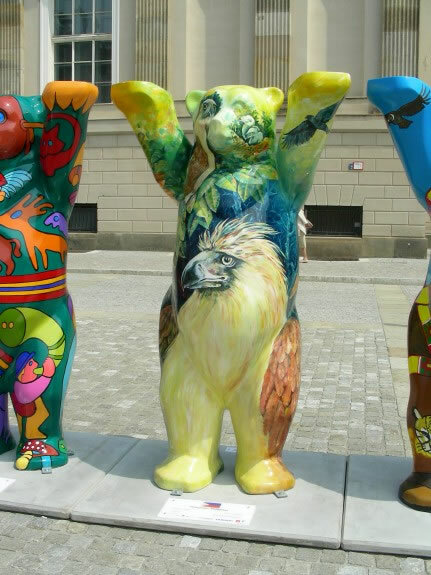 ART: More than 140 artists show the art style of their home countries. 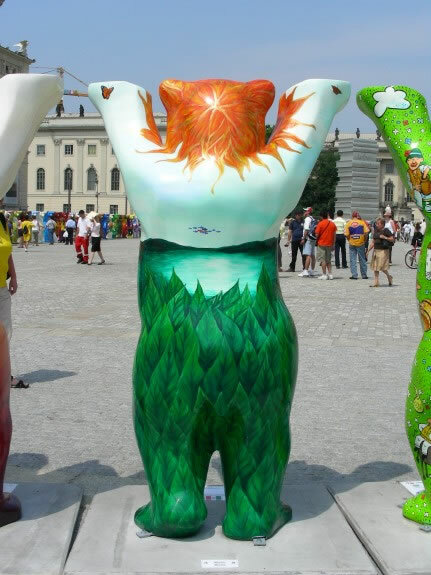 Standing in a circle, the bears form a unique work of art altogether. 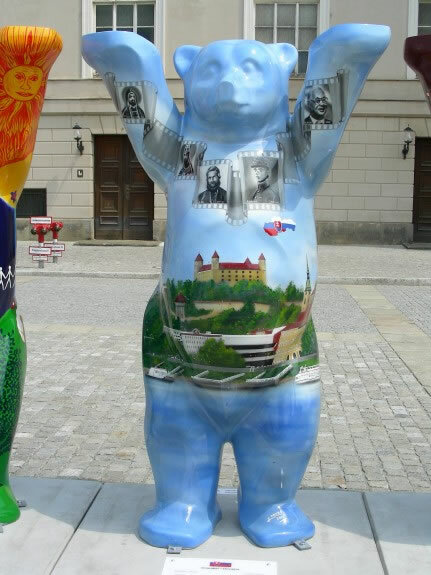 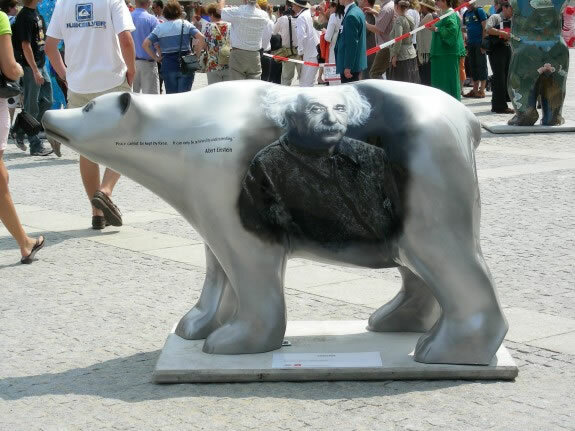 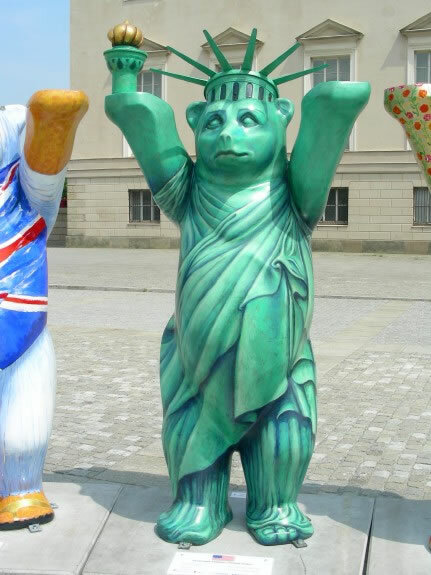 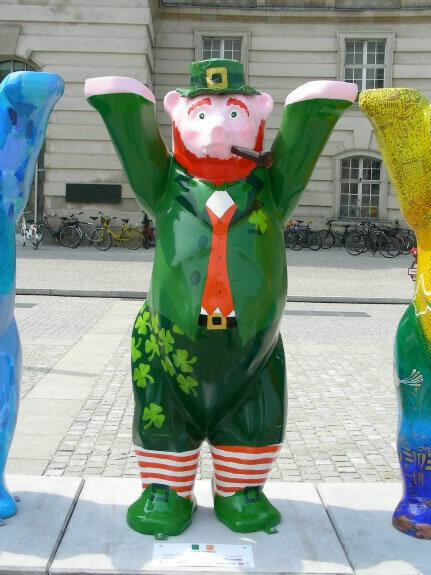 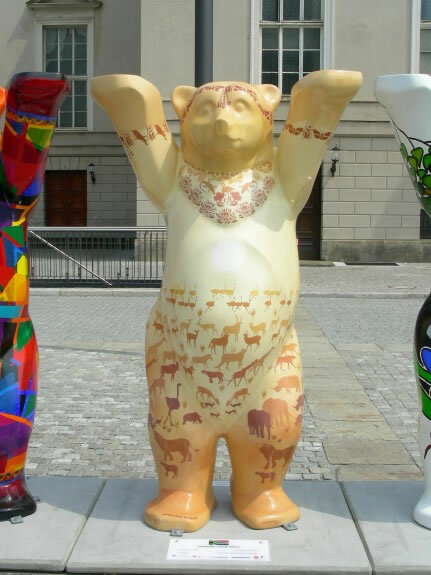 A MESSAGE: As a basis for a better understanding, the individual design of each bear includes a lot of information about the different countries. 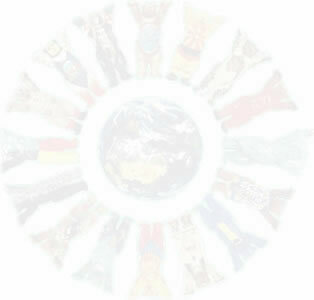 Together, the circle symbolizes love, peace, friendship, tolerance, and international understanding. 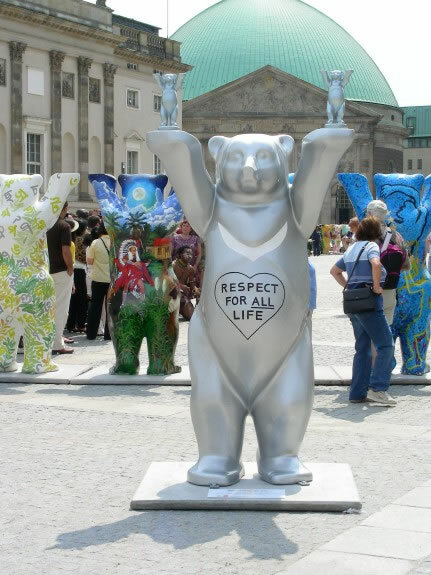 CHARITY: Over 1.127.000 Euros (March 2006) for charity organizations so far. 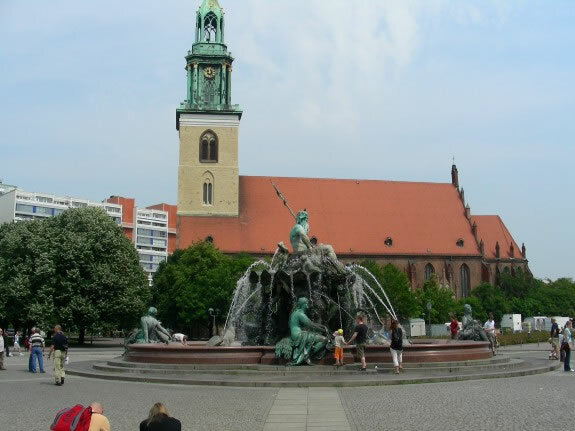 In each city where the circle is shown, activities (e.g. 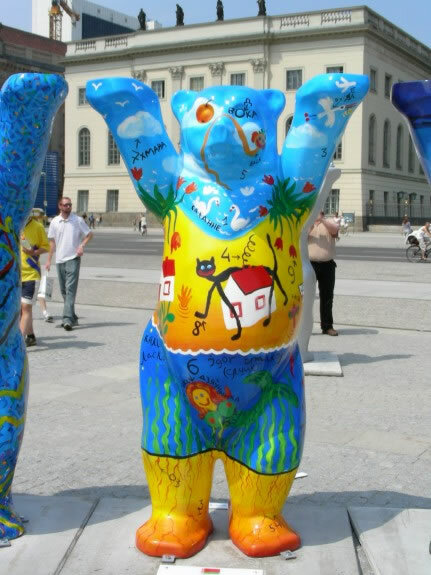 auctions) raise money for children in need. 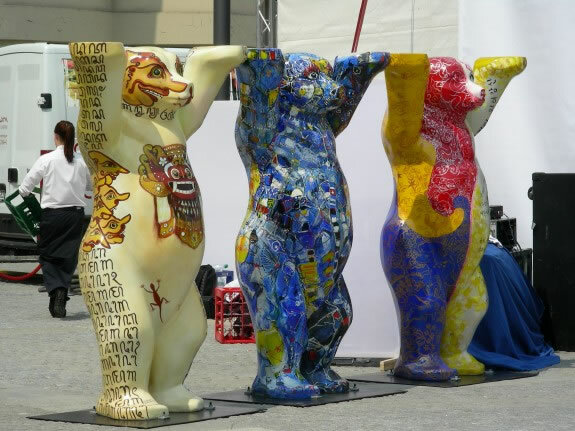 At the end of the world tour (and also during the tour) the bears are sold by charitable auction for UNICEF and other organizations helping needy children all over the world. 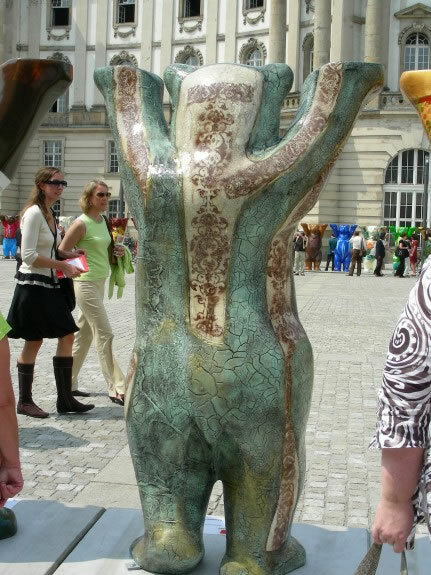 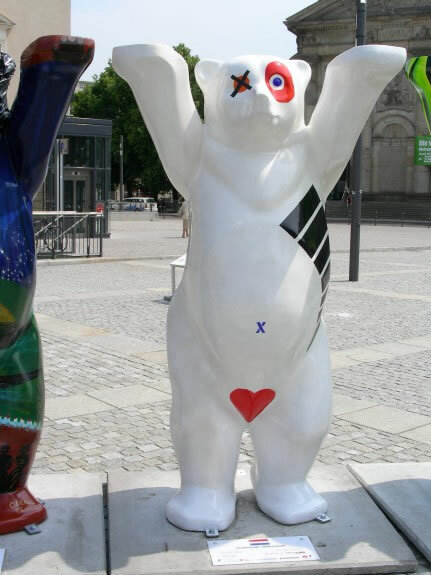 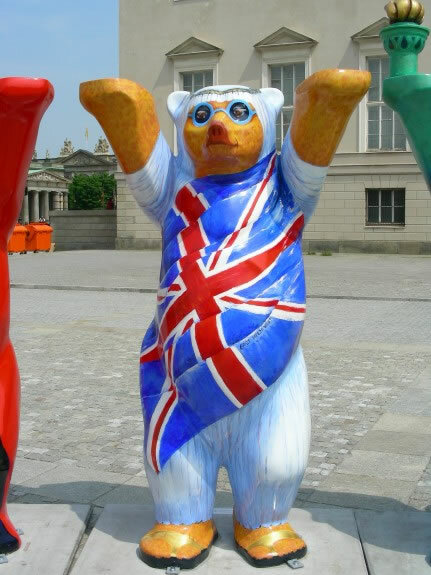 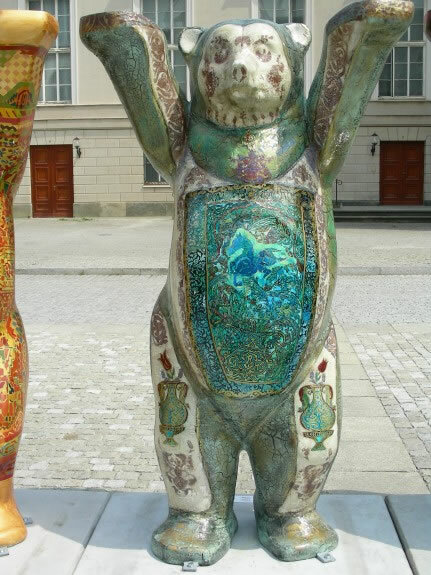 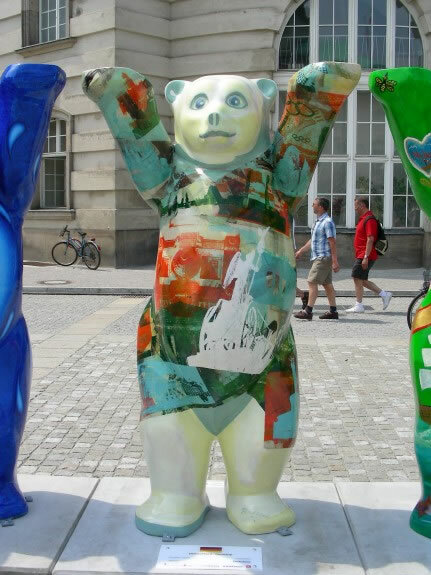 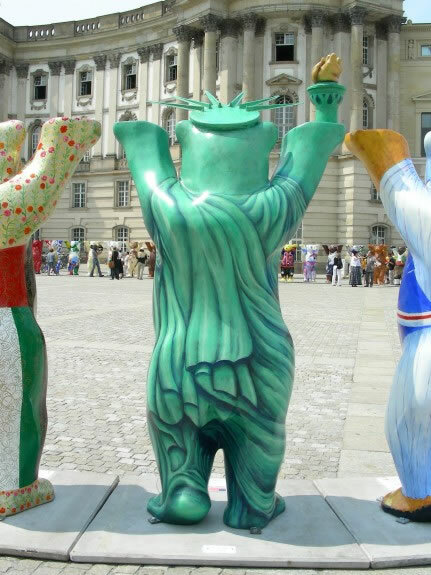 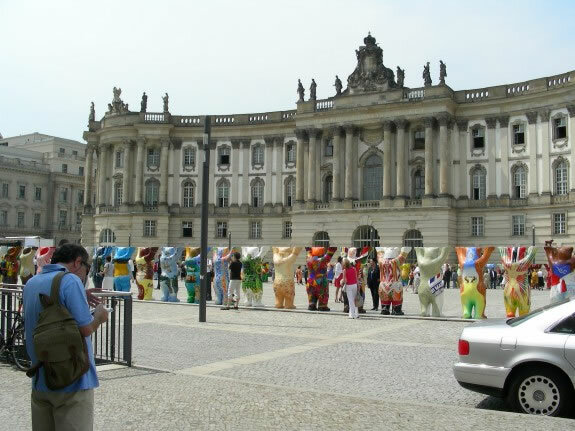 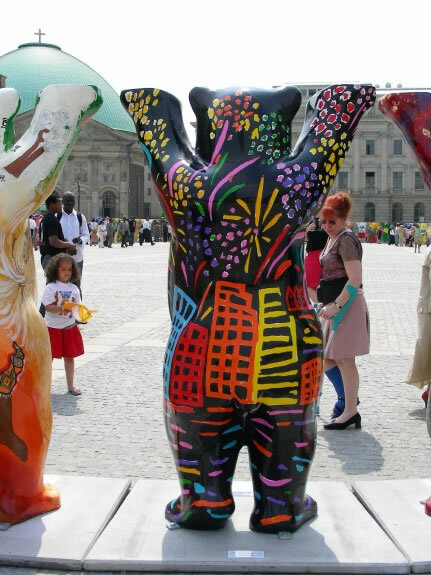 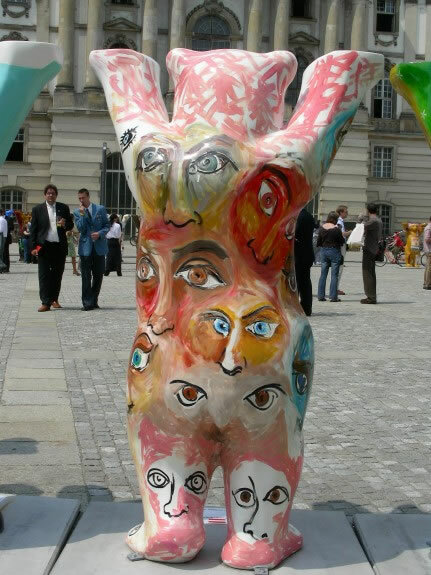 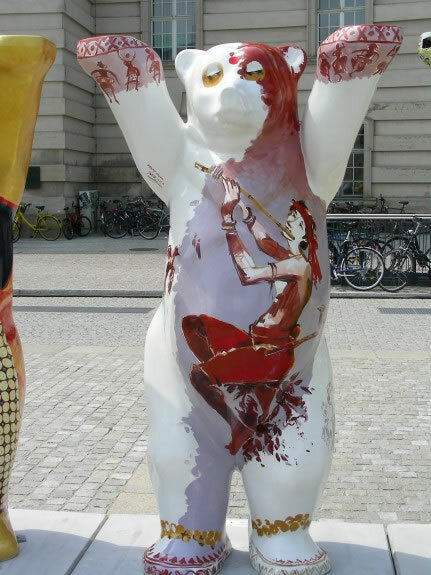 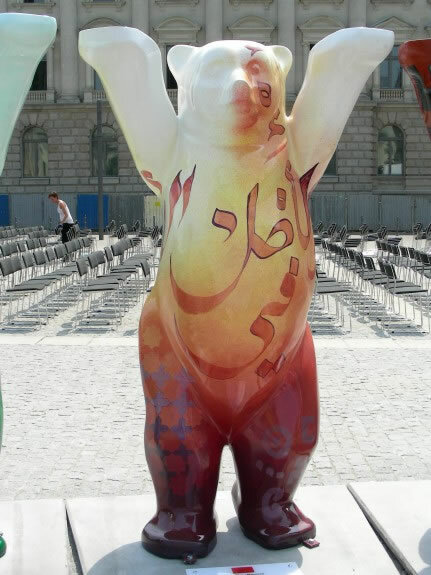 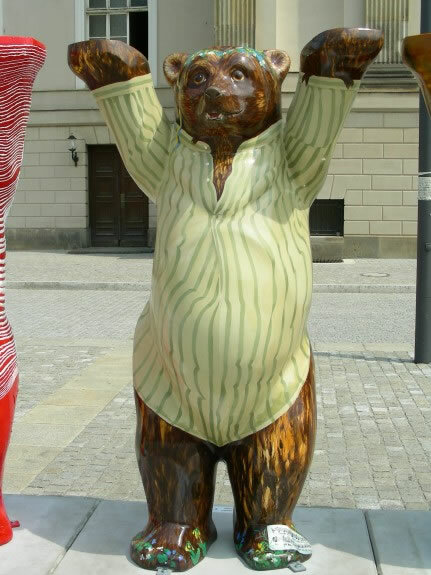 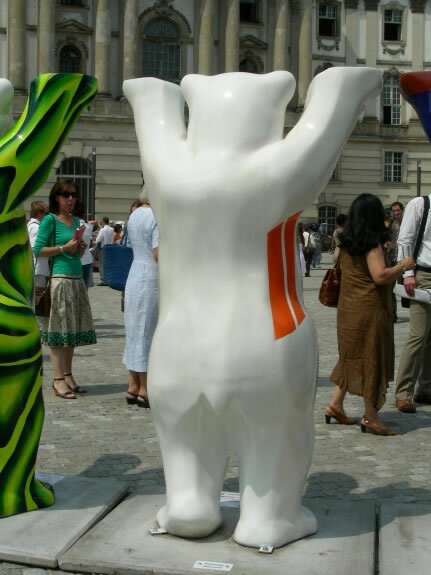 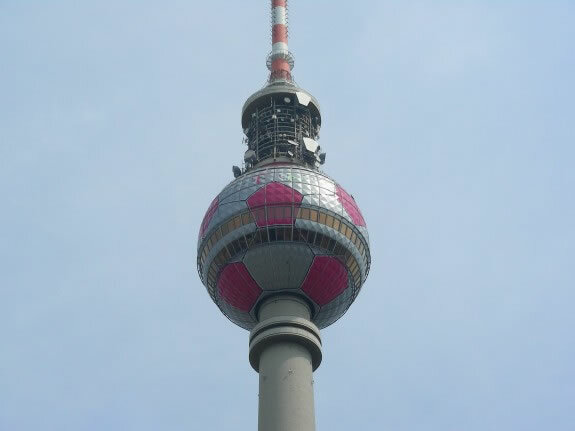 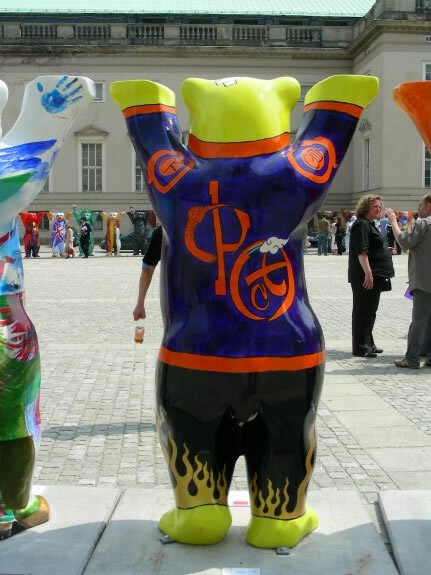 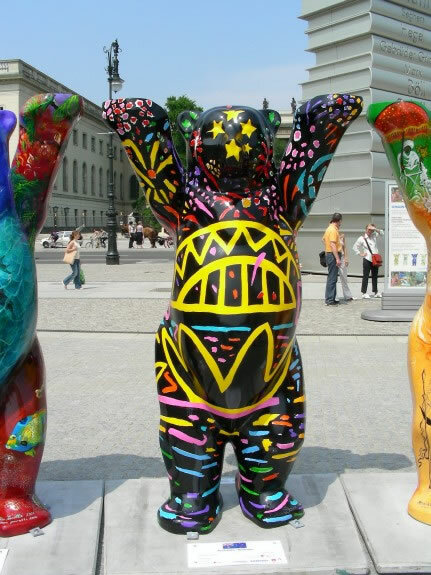 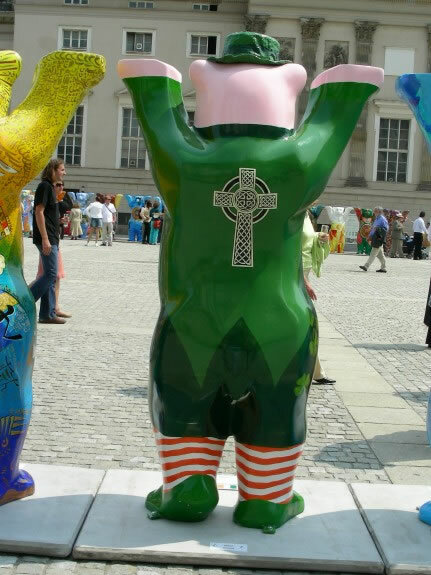 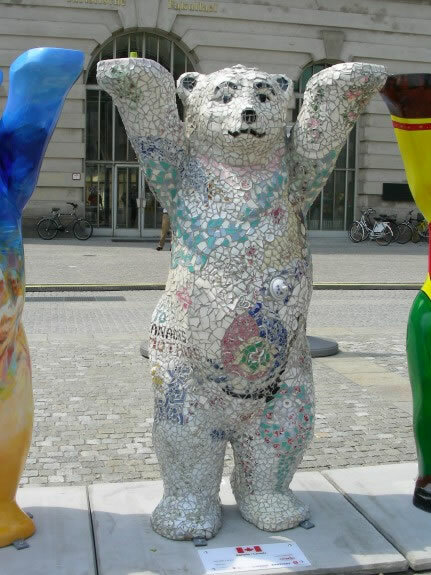 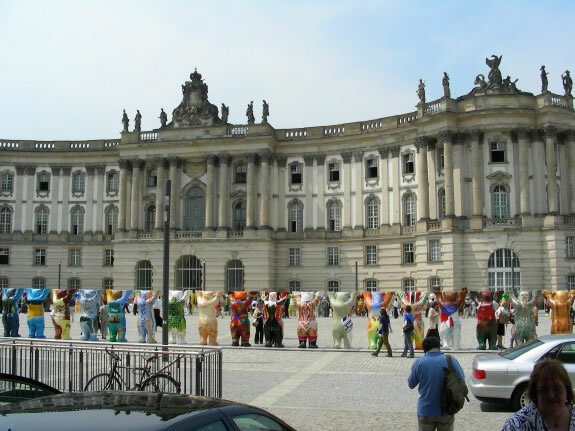 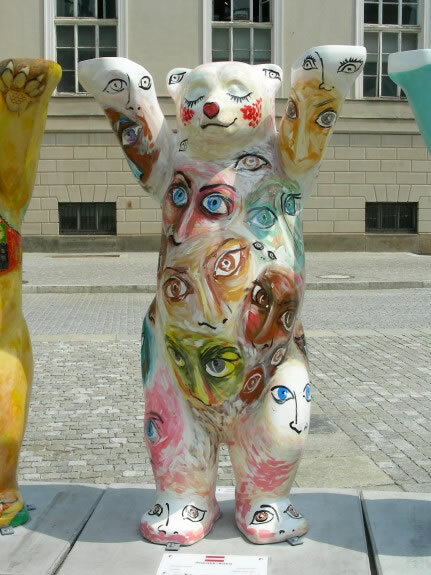 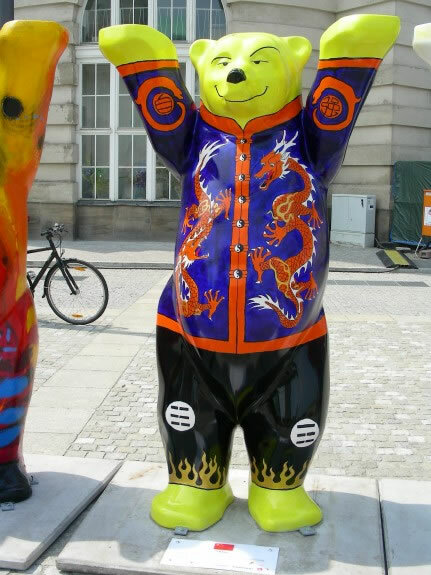 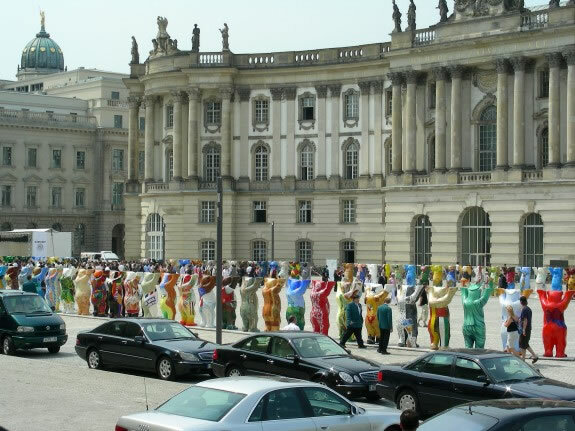 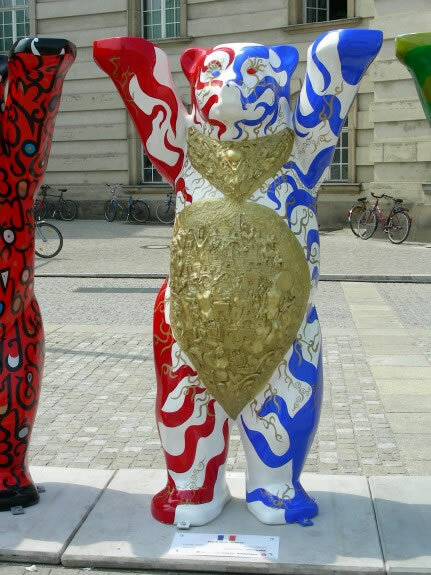 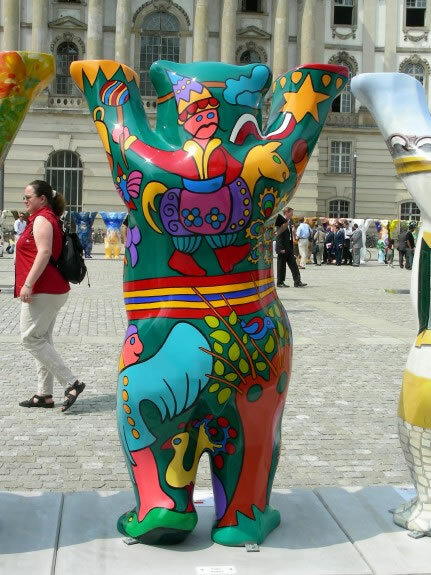 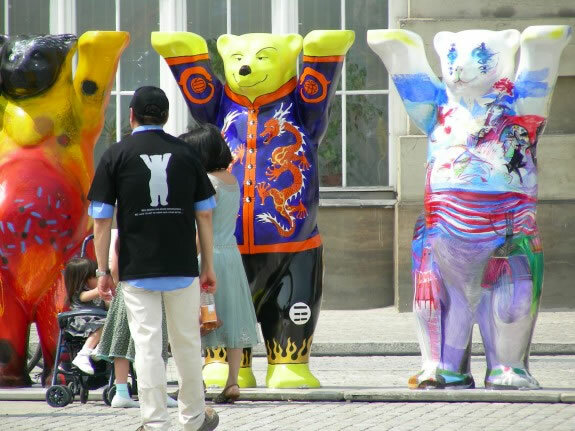 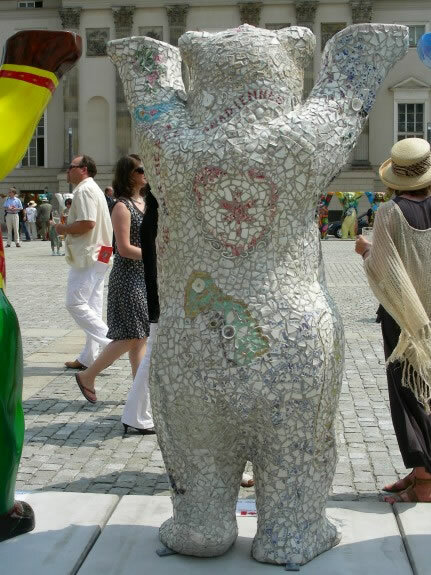 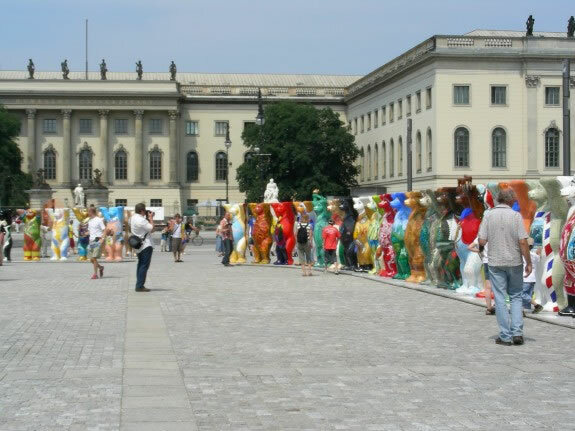 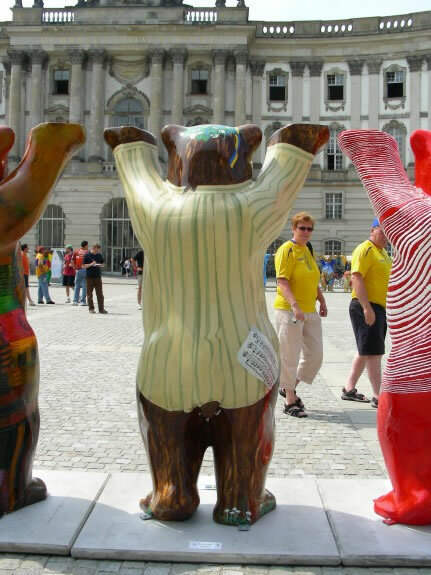 In Berlin 142 bears are displayed in a big circle as a symbol for peace, love, friendship and tolerance. 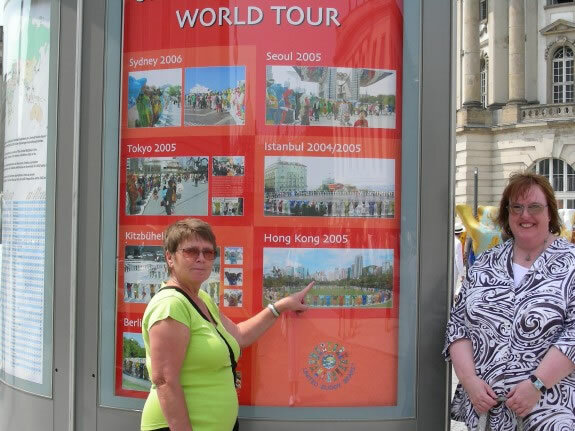 It was a wish of mine to visit this exhibition, since I have read about it on the Jackie Chan Kids Corner and saw all the beautiful photos from Hong Kong there. 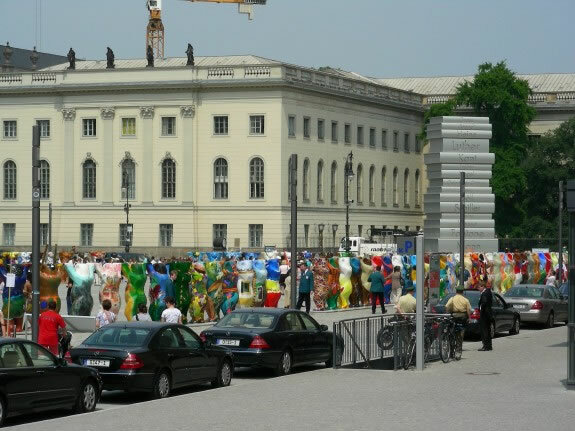 That's why I was glad to read about the start of the exhibition in Berlin and wanted to go there on the first day. 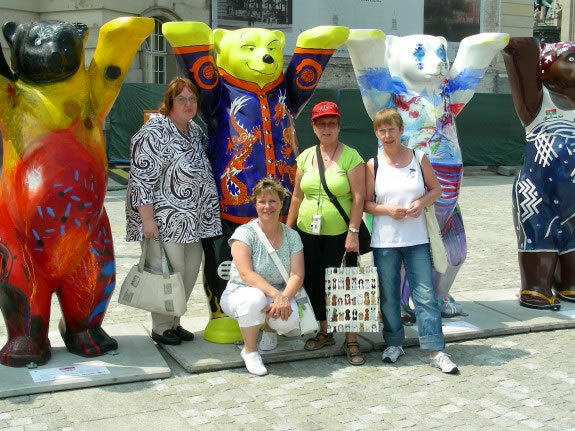 That was also a great opportunity to meet with two other Kids Corner Forum Members: with my friend Ute and also with Iris for the first time. 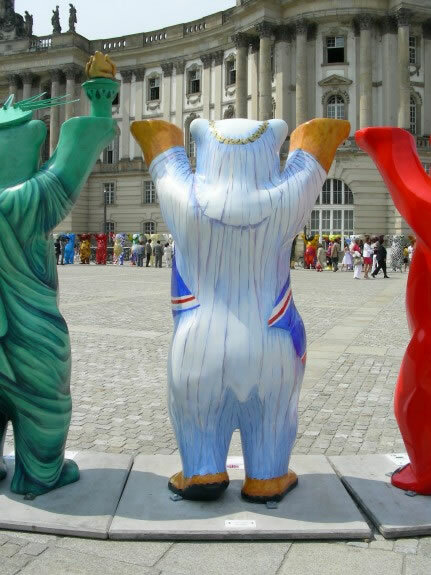 It's funny, because we are from totally different parts in Germany: Ute from Molsberg near Frankfurt in the western part, Iris from Hamburg in the nothern part and me from Leipzig in the eastern part. 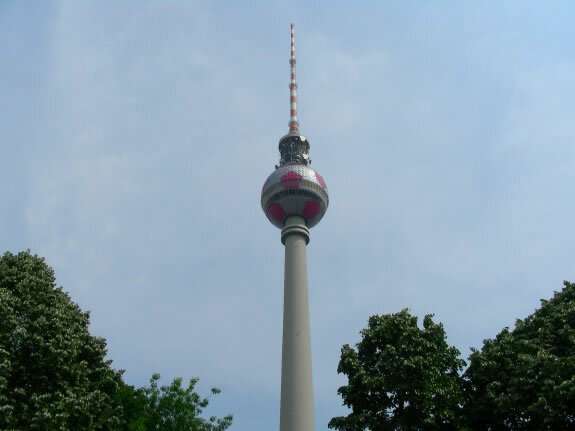 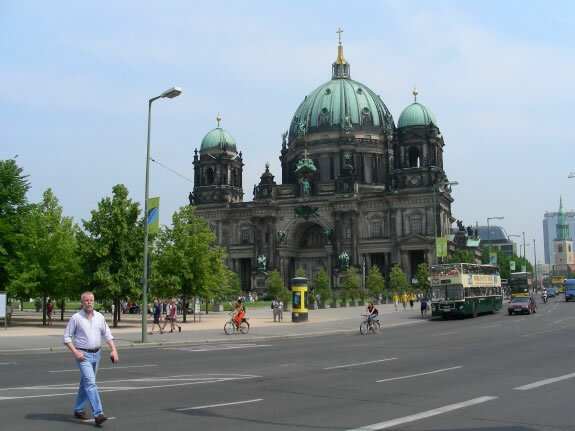 And now we came together almost in the middle of Germany in our capital, Berlin. 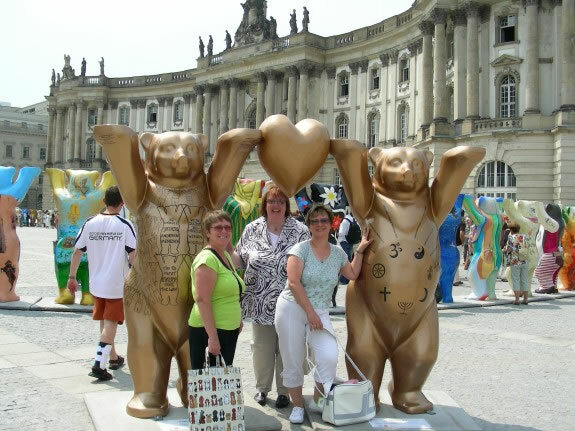 I have to say that we had probably never would have met each other without being Jackies fans! 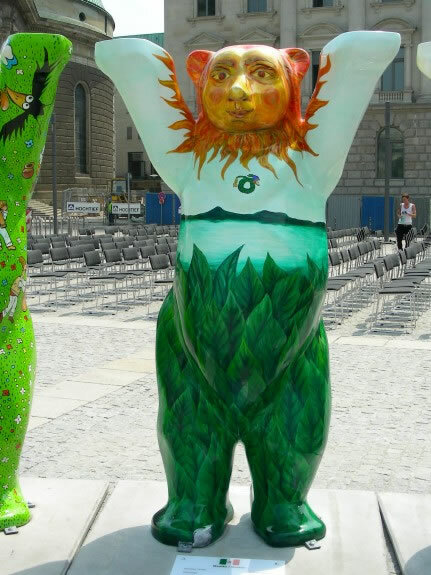 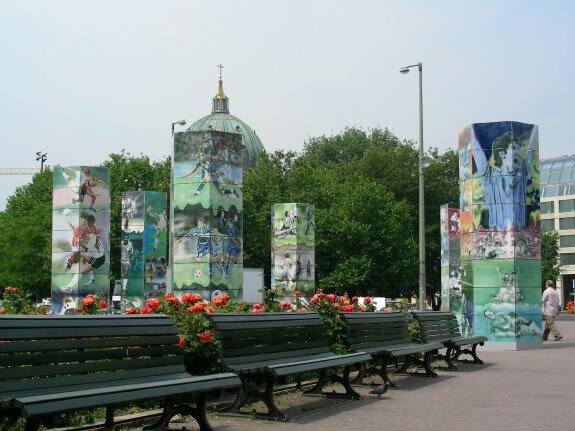 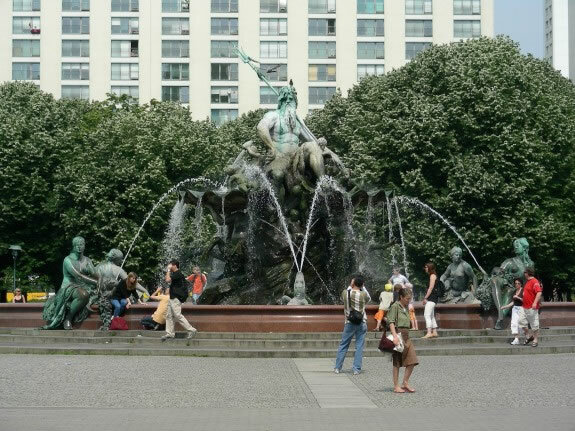 We met at the fountain "Neptun-Brunnen" and from there we went to the street "Unter den Linden" where the exhibition takes place at "Bebelplatz" from now on until the end of July. 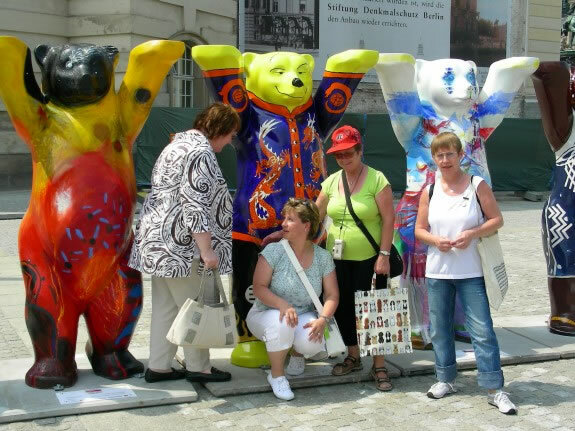 There we met with Heike, a fan of Jackie's from Berlin. 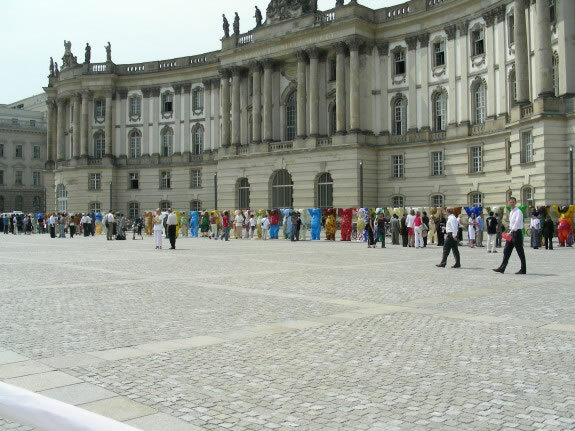 After the opening ceremony with some celebrities from politics and city it was possible to visit the exhibition finally also for the public. 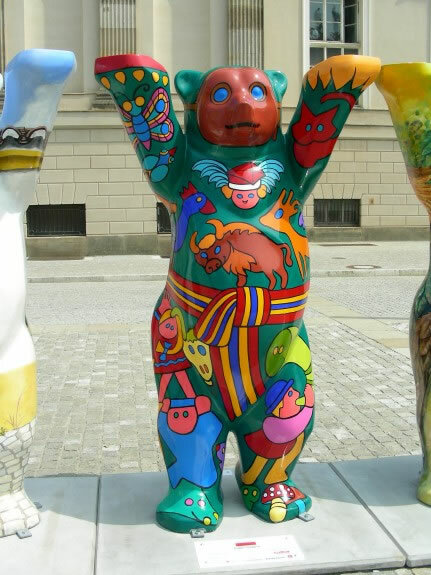 We all were impressed about all these wonderfully designed and very colorful bears. 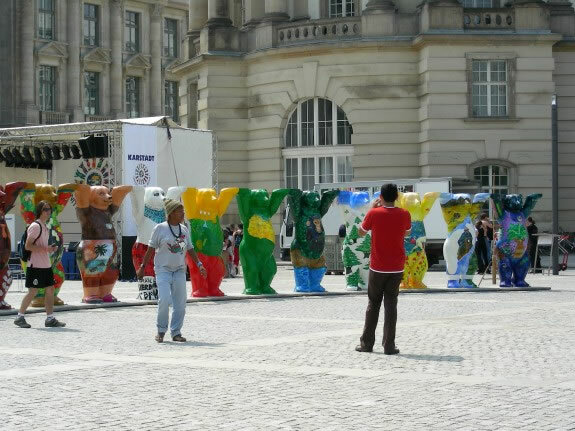 At first it was my wish to take photos of all these bears and share them with you, but then I decided to take "only" photos of the bears from the countries where the most frequent Kids Corner Forum visitors are. 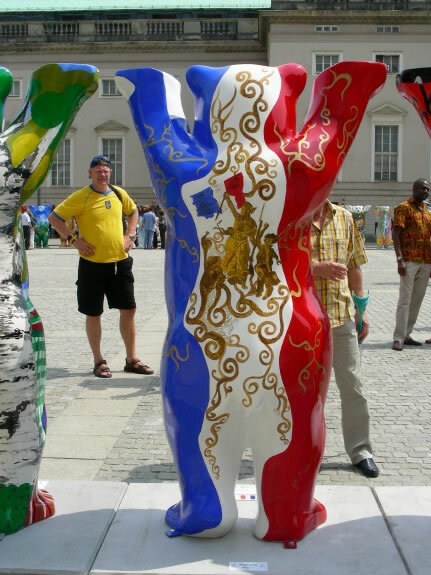 Austalia, Austria, Belarus, Canada, China, France, Germany, India, Ireland, Italy, Mexico, Morocco, Netherlands, Philippines, Poland, Slovak Republic, South Africa, Sweden, Turkey, United Kingdom, and United States of America. 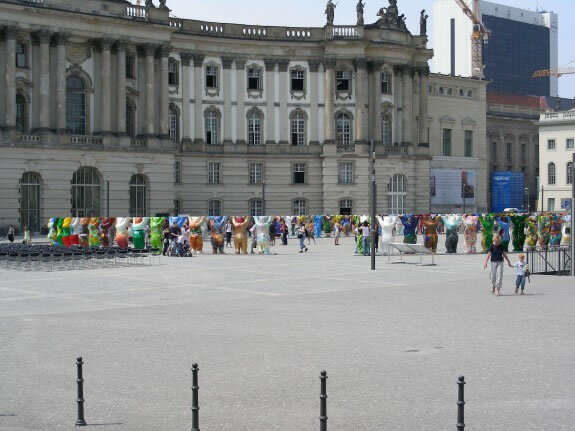 I hope many visitors see this exhibition. 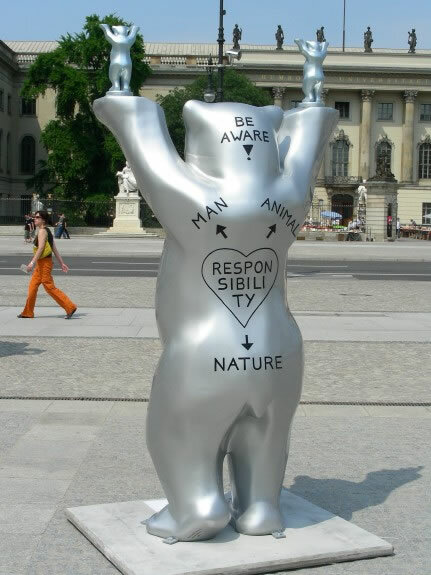 If many people would think a little bit more about the slogan, it would help to make this world better!